Poll finds Haniyeh upsets Abbas among Arab residents of Judea, Samaria and Gaza 62%-32%, gaining boost from terror war on Israel. Support for the terrorist organization Hamas has skyrocketed in Judea, Samaria and Gaza according to a new poll, after Hamas "skyrocketed" Israel with a massive missile barrage and terror war in Operation Protective Edge. 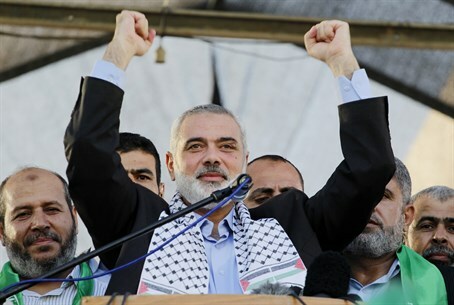 A full 61% of Arab residents of Judea, Samaria and Gaza would pick Hamas leader Ismail Haniyeh for unity government president if elections were held today, according to the Palestinian Center for Policy and Survey Research poll reported Tuesday by Associated Press (AP). By contrast, Palestinian Authority (PA) Chairman Mahmoud Abbas was found to have dropped sharply to a mere 32% in support. The survey also found a "grass is greener" effect, with support for each of the two higher in the area under the other's control; Haniyeh received 53% support in Gaza and 66% in Judea and Samaria, while Abbas got 43% in Gaza and 25% in Judea and Samaria. The poll also suggested that a majority of Arab residents of the region support appropriating Hamas's active terrorism against Jews in Judea and Samaria as well, a trend that accompanies a recent rise in terror incidents there. The polling agency said Haniyeh gained a majority of support for the first time in eight years; the survey included 1,270 respondents and had a 3% margin of error. Just in May a similar poll found jailed arch-terrorist Marwan Barghouti of Abbas's Fatah faction was favored for president of the new unity government, outpacing both Abbas and Haniyeh. In an open letter last month, Barghouti called for a Fatah revolution, urging the group to further unify with Hamas and reject negotiations with Israel in preference of "resistance." The new poll also confirms another survey last Wednesday conducted by the Palestinian Center for Public Opinion (PCPO), which found 89% of Gazans support indiscriminate rocket fire against Israel civilians. On the other side of the Arab support for the terror war, an Israeli poll late last month after the ceasefire found a 59% majority of Israelis felt Israel did not win Operation Protective Edge, signalling the frustration over a perceived lack of decisive military action against Hamas. The poll likewise found that Prime Minister Binyamin Netanyahu's approval rating has taken a nose-dive during the operation, plummeting from a high of 82% at the time of the IDF ground entry to an abysmal 32% after the ceasefire with Hamas.